What are the benefits of keto coffee? Keto coffee (also known as butter coffee, fatty coffee or Bulletproof coffee) is a delicious frothy coffee drink that can help decrease hunger, increase energy and improve mental clarity.You may wonder how one drink can do all that. A breakdown of the ingredients can help clarify things. I make mine with organic coffee (12 oz. ), 1 T grass-fed butter, and 1 T of MCT oil. If you’re new to using MCT oil start with a smaller amount and increase over time. Coffee is not only delicious but it also has some health benefits. Coffee provides antioxidants which help your body fight off cell damage. Studies have shown that coffee may provide protection against Type 2 diabetes, cancer and dementia.Using organic coffee is preferred to conventionally grown coffee. Conventionally grown coffee is chemically treated with synthetic fertilizers and pesticides. Choosing organic helps to ensure that your coffee does not contain these extra chemicals. Butter makes this cup of coffee creamy, rich and delicious. But more importantly grass-fed butter is higher in Omega-3 fatty acids, antioxidants, beta carotene and Vitamins A, D, E, and K. It also contains higher levels of CLA which is a fatty acid that helps your body store muscle instead of fat. Why coconut oil or MCT oil? Coconut oil contains medium-chain triglycerides (MCT) which boost your metabolic rate and provide easy energy for your body and especially your brain. Using coconut oil is an inexpensive way to get MCTs but purchasing MCT oil is a much more powerful way to boost ketones. I use NOW brand MCT oil from my local health food store or sometimes Bulletproof Brain Octane. The Bulletproof brand is more expensive but also contains a more concentrated form of the good stuff. In addition to boosting your ketones for more fat burning and brain energy, MCT decreases the action of ghrelin which is the hormone that makes you feel hungry. What if I don’t like coffee or can’t drink coffee? If you don’t like coffee or can’t drink it you don’t have to drink keto coffee as part of your ketogenic diet. You can get healthy fats from a variety of sources. You can even get the benefits of the grass-fed butter and MCT oil by using them in other ways. For example, you can cook with butter and use the coconut oil or MCT oil as part of your salad dressing. Using decaf coffee is fine. I’ve even had people say that they enjoy the recipe with tea or chai tea instead of coffee. I’d love to hear if you’ve tried keto coffee and what you thought about it. Comment below. Do want to eat healthier, but you’re super-busy? You may eat out several times a week because that’s what you have to do. That’s what works for you and your family (when it comes to time and convenience). But you probably realize it’s not working great when it comes to your health and fitness goals. You want better health. You want to eat better and you don’t want the extra calories, fast food and junk food as much anymore. And you DO want to save time and money.I get it! I am here to help you. I have a simple strategy that I’m more than happy to share with you. It will help you to plan and prepare healthy meals for the week. Now, you don’t need to completely abandon your regular meals out. You can use my strategy to help you eat out just one or two fewer times per week. It’s up to you. As with any lifestyle change, start gradually so you can build consistency. The key here is to make it easy, doable and rewarding enough to do again and again. Let me walk you through my simple meal prep system, and how this can work for you. I work 40+ hours per week and I prefer to do my meal planning on the weekend. I’ll flip through my recipes and choose a bunch to make that week. I have recipes I print and keep in a recipe book but most often I go to my Pinterest boards to find the recipes I’ve saved.I’ll even pick which days to have which meals if I’m feeling overly ambitious, but that’s not necessary if you’re new to this. I bookmark the pages and write my chosen recipes down in a notebook or even a sheet of paper to put on my fridge. Then I create my grocery list. I take a quick look in my fridge, freezer and pantry, and list the recipe ingredients that I need to buy. I know the layout of my grocery store so I write down the ingredients in the order that they will be in the store. That makes shopping a breeze. If you’re not sure you have enough of an ingredient already, consider buying a “backup” one just in case. I’ve had times where the tomato sauce I planned to use was a bit short of what I actually needed. Having to run out in the middle of meal prep can be very frustrating. I keep most of my staple ingredients on hand and I have a list for when I go to Costco. Another thing to consider is doubling the recipe(s), so you can prep and cook once, but have twice the meal at the end. The extras can be taken for lunch, or frozen to pull out the night before a busy day, so you just need to heat it up when you’re ready. If you’re doubling a recipe, don’t forget to double the amount you buy from the grocery store. Once you have your handy-dandy grocery list ready, hop on over to the store and pick up your essentials. 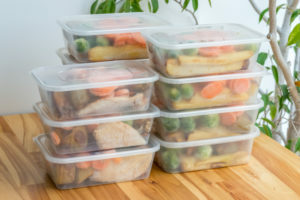 If you don’t have enough food storage containers for your meals, now’s the time to pick up some of those too. My favorite containers are Mr. Lid. I love these because the lids never get lost. If you’re not a fan of washing and chopping produce, then consider buying them already pre-washed and pre-chopped, or even frozen. 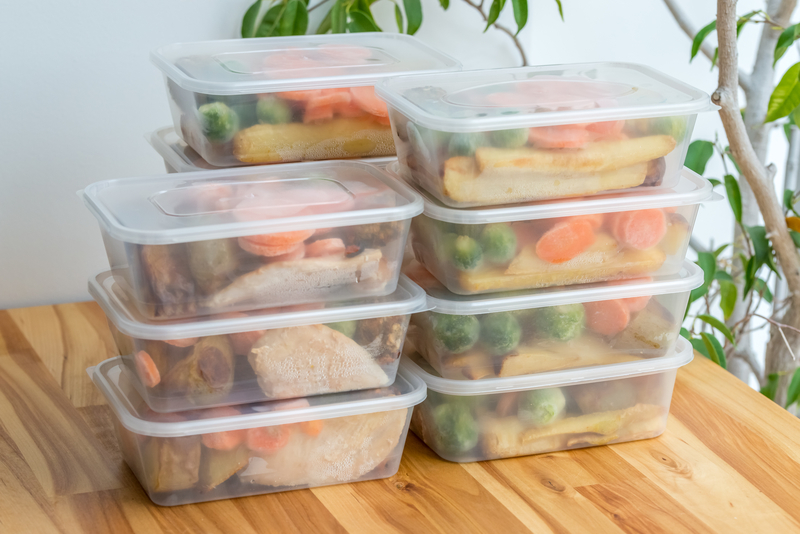 You can make your meal prep even easier if you don’t mind spending a couple of extra dollars. Since you’ve already chosen your recipes and have your groceries, let’s get started on prepping some of the ingredients. I like to book off 1-2 hours one afternoon for this. Get your recipes ready, clear off your counter, and play some music (if you’re so inclined). At this point, depending on time, I’ll either prep the ingredients, or pre-cook the entire recipe. Sometimes just washing and chopping produce and putting it in containers is a huge time-saver for weeknights. Or, you can go through and make a whole meal, and divide it up into portions and refrigerate or freeze. It’s really up to you, because the more you do now, the less you’ll have to do when you’re hungry. There is one meal that is easiest to plan and prepare in advance. It’s one that’s also often the most difficult to eat at home if you’re busy. I cook up a bunch of hard boiled eggs on the weekend and I bake a tray of bacon. That way each morning I just need to grab two eggs and two pieces of bacon and I’m all set for breakfast. When I get tired of hard boiled eggs I make egg salad and eat them up that way. Another great way to have easy breakfast is to cook a frittata and divide it up in individual servings. With a little planning, you’ll be able to eat healthier while you save money and eat real food. This may take some getting used to, so if I can be of help, please reach out and let me know. Do you need a morning makeover? Are mornings pleasant for you or do you just try to survive them until your coffee kicks in? 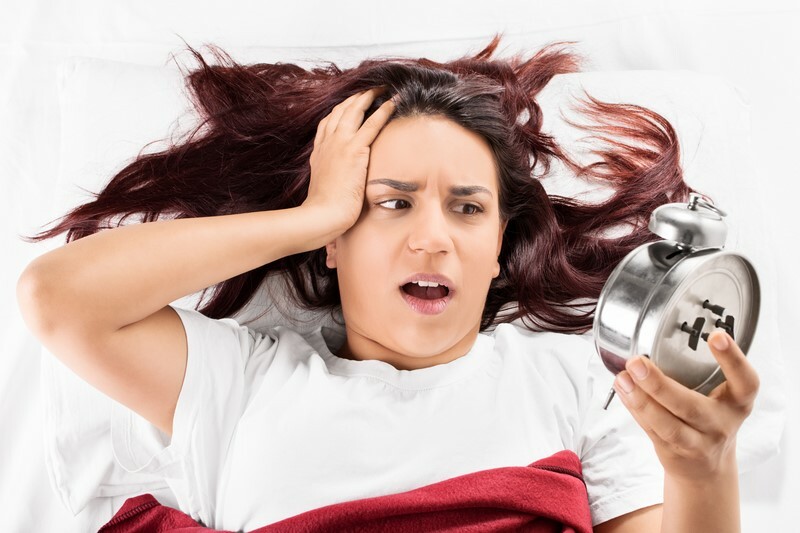 Do you hop out of bed when your alarm goes off or hit the snooze over and over? How you start your day can set the tone for your whole day. There’s a reason that there is a saying about getting up on the wrong side of the bed. I’m going to give you some tips for how to do a morning makeover to set your day up for success. I’m a born night owl. Most of my life I went through my mornings in a fog. I didn’t want to talk to anyone and I wasn’t amused at all by morning people. How dare they talk so loud and be so cheerful! I remember when I was a child my Grandpa (who got up before the sun) used to get just a few inches from my sleeping face and sing “Good Morning, Mary Sunshine” to me. His voice was beautiful, the song was sweet, he loved me, and yet I responded with a groan and pulled the pillow over my head. Late nights were my happy time. I would generally have to make myself go to bed because I never felt ready. Unfortunately I was not productive in those late hours. Time was wasted on TV, video games or social media. A few years ago that all changed. I took on a challenge set up by author Jon Acuff to start working on something that mattered to me. As part of that challenge I began waking up at 5 a.m. so that I could work on my goals before the rest of the house was awake. It was a real stretch for a night owl but I found that I could get more done in my day and my whole day was better. I am now a dedicated morning person. This doesn’t mean I’m ready to have a deep conversation early in the morning but I don’t groan at everyone that looks at me either. I go to work with a sense of accomplishment and a lifted mood. My perfect morning looks like this: I wake up after a good night’s sleep. A cup of delicious keto coffee to kick starts my fat burning for the day. I spend time studying my Bible and praying. Then I open my journal and review my goals for the day and do a thought download. I get a bit of exercise and meditation in. Next is reading for personal growth. 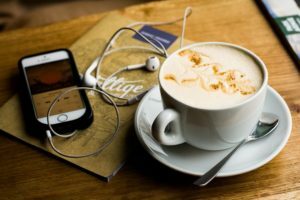 If I don’t have time left to read I will listen to a podcast or video that helps me grow or motivates me. Listening to audio while getting ready for work or during my morning commute has been another game-changer for me. I’d like to guide you through some steps to create your perfect morning routine. What does your perfect morning look like? Take a few minutes to think about that and maybe even write it down. You can’t begin to design a great day if you don’t know what you’re aiming for. It’s not going to happen by chance. 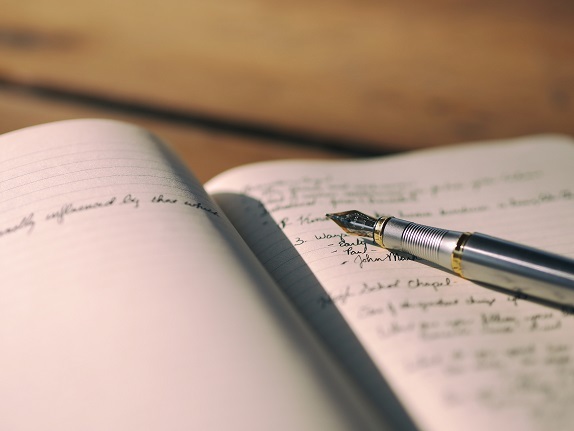 Write it down in as much detail as possible. Think about why you want to do these things. For me it is to have a sense of accomplishment, to focus my time on the right things, to start my day on a positive note, and to free up my evenings for time with family. Set your desk up with whatever you plan to work on – Bible study, journaling, reading, etc. Pull out your description of a perfect morning that you wrote down in the earlier step. If you didn’t write it down I suggest you do it now. Put it where you will see it first thing in the morning. Your tendency will be to wake up and do what you usually do every other morning. For a while you may need a reminder that mornings are different now. As you practice your new routine you may find the need to tweak it a little to find what works for you. That’s OK. Tweak as needed. Watch out that you don’t slip back into your old habits. It’s easy to do. If you slip up get right back on track the very next morning. Starting your day off right is worth it and sets you up for success for your whole day. Keep using those first few precious minutes of the day to establish some positive change in your life. So how will you design your perfect morning? Post in the comments and let me cheer you on! If you enjoyed this post I’d love to send you more great information in your email. Subscribe below.